From a high of $77 barely 6 weeks ago the crude oil price has been on a relentless downwards slide, slicing through key support levels all the way to a new low for the year of just $50! A move that NO ONE saw coming! With the key triggering price point coming late October when the oil price failed to hold support at $64. Firstly, a reminder of my forecast expectations for the year which were the for the oil price to target a trend to $80, that came within touching distance of achieving early October. 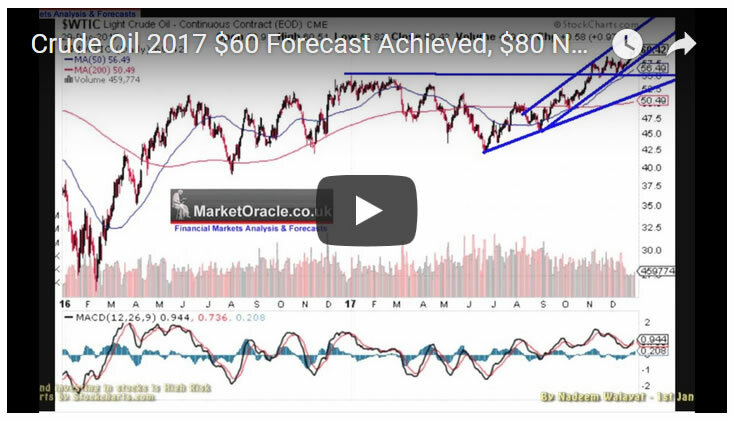 Therefore my forecast remains as at the start of the year that the crude oil price will target a trend to $80 which is not likely to be achieved during late December / early January 2019 as so far it is not showing any signs of wanting to breakdown into the lower end of its trend channel the consequences of which would be it would take a lot longer to get to $80. So what happened to the oil price to turn a volatile bull market into a nose bleed drop bear market during October. Why did the oil price fail to hold support at $60 -$64, a clue being that the oil price is not behaving in a technically sound manner.